Robert Ford isn’t exactly a household name, and it’s been over a decade since he published his first (and seemingly only) novel. He went on to write several award-winning one-act and full-length plays that have been produced both in the U.S. and in Europe, but his novel remains a unique work. 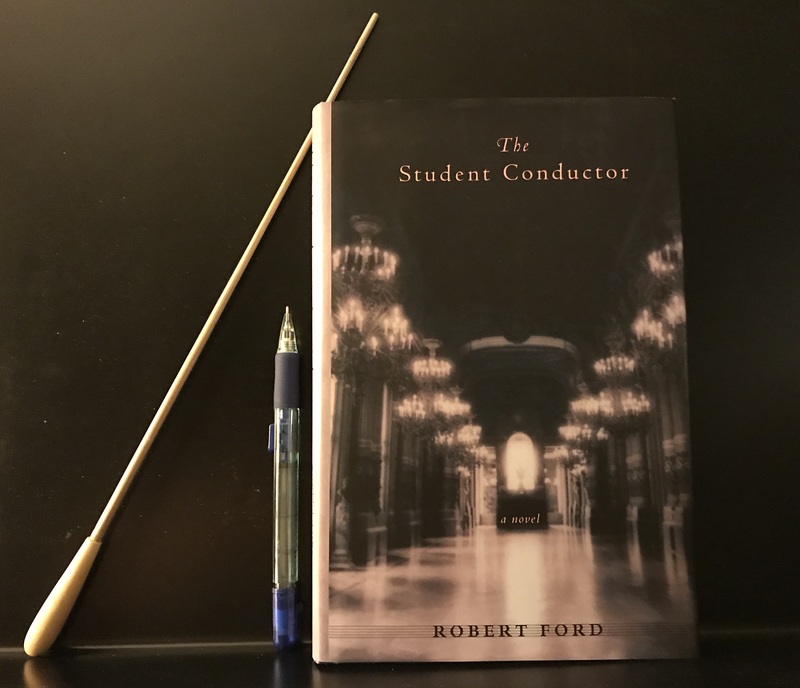 The Student Conductor was first published in the U.S. in 2003 with subsequent editions in Europe and Australia. It gives readers a look into Ford’s imagination as he conjures up plenty of intrigue and heart. He also guides readers deep into the magical world of classical music giving them an idea of just what it takes to become a professional symphony conductor. Although the book tells a fictional story, the lessons Ford provides on various aspects of classical music, and on conducting in particular, can be very instructive for anyone attempting to pursue that objective. Even for readers without any musical background, the story is compelling, tugging at one’s emotions and personal dreams of success. Ford sets the book in 1989 Germany on the verge of reunification and uses the backdrop of the political turmoil that ensued between the Second World War and the prospect of a reunited Germany, while never losing sight of his protagonist’s main objective. The politics of the country bleed over into the concert hall. He includes a complicated love story and a tortured, yet brilliant mentor for the protagonist to both endure and learn from. As the story unfolds, their secrets are artfully revealed, not disclosing too much too quickly. Ford makes it clear that it takes hard work to become a skilled conductor. He shows that it requires extreme dedication and skill, and not all who attempt it can succeed. He writes with authority, fully utilizing his Ivy League musical background (Master of Music from Yale) and his literary education (MFA in writing from the Michener Center for Writers at the University of Texas at Austin) in the process. He knows the musical subject well and shares his knowledge using vivid examples in the context of the fascinating story he weaves. He begins his tale by introducing the protagonist, thirty-year-old Cooper Barrow from New York, as he travels through Germany by train for his audition with Maestro Karlheinz Ziegler. Ford’s short, yet vivid description of the journey sets the tone nicely for a more detailed dive into the audition itself. The feel of the concert hall, the manner of both Barrow and Ziegler, and the tension of the event all coalesce into a powerful sequence. The reader easily enters the world of this audition in their mind’s eye. For non-musicians, this early sequence might be reminiscent of a difficult situation where the reader may have had to demonstrate mastery of a technically challenging subject. The grilling that Barrow receives is effectively a doctoral oral examination, except that in this case, instead of a committee, there is a single inquisitor barking instructions to test the limits of his skills and knowledge. If a reader happens to have a background in music, the details might also spark memories of their own excruciating auditions. Musical details of the works used are each quickly described with technical terms defined in context. The imaginary orchestra configuration is detailed, and the musical nuances all come to life in a few quick pages. This taut sequence is the first of many pivotal events in the story. For a musician, one of the more delightful aspects of the book is the detail surrounding the music and the technique needed to excel as either a player or a conductor. That’s not the say that the book is a technical manual or a textbook, but as part of the story, where the music fits, it isn’t avoided either. It’s not giving too much away to say that Ziegler strips away all of Barrow’s confidence during the audition to make a point. Ford’s description of Barrow’s mindset after enduring Ziegler’s hazing brings the lesson home. No matter which man chooses each particular orchestral work during the process, Barrow is outmatched. At the end of the audition, Ziegler agrees to teach him, but as the story unfolds, Ziegler doesn’t make it easy for his apprentice. Ziegler’s teaching style is similar to his examination style, and Barrow is constantly challenged in gory detail. Events move quickly, Barrow trying his level best to please his tough task master while learning from him at breakneck speed. Although his intention is to focus entirely on his work, Barrow is drawn to one of the musicians in the orchestra. Petra Vogel, an East German defector and oboist, catches Barrow’s eye almost immediately. Their relationship ebbs and flows along a competing arc to Barrow’s growth as the dutiful, and sometimes struggling student. Ziegler’s past unfolds at critical points in the story while always maintaining a bit of mystery. The maestro is haunted by his past including his professional accomplishments and failures, his relationships, and his time in the Nazi concentration camps. His past has molded his approach in various ways, and his interactions with Barrow are particularly complex. The reader gets to know Barrow’s fellow graduate students. Each helps the others survive the tasks at hand, not as competitors, but as compatriots from different homelands. The concertmaster of the orchestra also has a unique perspective. He’s Romani and is not completely accepted by the Germans he meets. As an outsider, he has insights and impacts on Barrow’s life beyond the expertise he brings to the music. Ford takes the adventure from the concert hall, to the streets and homes of Germany, immersing readers into the world around the characters. From a personal perspective, I can attest to the value of this story to a fledgling conductor. A friend and mentor suggested that I read the book about a year after it became available as I was beginning to dabble with musical direction and conducting. The details of Barrow’s musical study in the story resonated with the work I was doing with my own small ensembles, though I fortunately didn’t have Barrow’s tough task master scrutinizing my every move. To find out whether Barrow ultimately succeeds or fails in the hands of Herr Ziegler, you’ll have to read the book. There is a bit of unfinished business in the story, but there are sufficient clues for the reader to deduce a satisfactory resolution. Read more about Robert Ford on his website at: www.robertford.info.